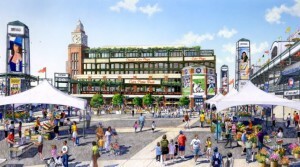 Artist rendering of the proposed fan plaza outside Wrigley Field. Renderings courtesy of the 1060 Project. The video boards above the historic ivy-covered outfield walls are only the first clue that this isn’t your grandpa’s Wrigley Field anymore. And though you won’t be able to see it, new Wi-Fi and DAS networks are coming soon to the Friendly Confines, as part of the Ricketts Family’s ambitious remake of Wrigley Field and its surrounding area. 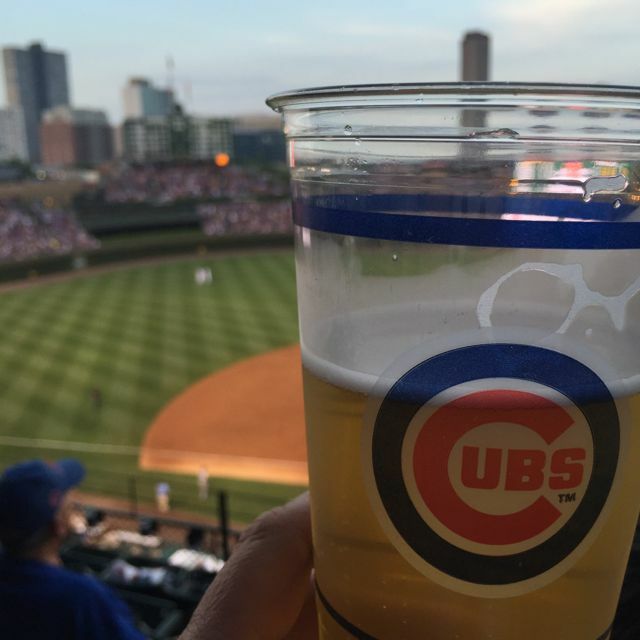 And according to Cubs IT executives, the team is tapping firms with NFL stadium expertise to bring not just fast and thorough wireless coverage to fans, but also back-end ownership and analytics so that the team can more effectively track online activity to improve the fan experience as well as improve the team’s return on infrastructure investment. Though Wrigley Field has had full fan-facing Wi-Fi for longer than most Major League Baseball stadiums — the AT&T-built network arrived in 2012 — with the major overhaul of not just the park itself but the surrounding areas outside beginning this offseason, it was time to rethink the team’s overall approach to wireless connectivity, said Andrew McIntyre, senior director of information technology for the Chicago Cubs. “As it all starts looking more like a campus, it changes the dynamics” of how you provide wireless coverage to all areas, said McIntyre. As a regular attendee, speaker and steering council member of the SEAT Conference — the premier gathering of stadium technology professionals — McIntyre was well aware of all the new trends for large-venue Wi-Fi and DAS deployments, some of which were taking place in football stadiums across the country. As major construction took place this past offseason, the Cubs de-activated the AT&T Wi-Fi network that had previously served fans inside the ballpark. Even though it doesn’t sound very old, McIntyre notes that many other stadiums around the country have had to completely overhaul Wi-Fi networks built just several years ago, due to the ever-increasing demand for more bandwidth and the rapid introduction of new phones and devices that fans are bringing to games. What McIntyre and the Cubs IT team saw was a future where Wi-Fi was used not only to provide connectivity, but to also provide a deep link between venue owners and operators and the digital activities of their visitors, through advanced analytics of Wi-Fi traffic. In the end the Cubs selected Wi-Fi provider Extreme Networks for the Wrigley project, in no small part due to Extreme’s experience in deploying Wi-Fi networks and Wi-Fi analytics inside numerous NFL stadiums. “We saw patterns emerging in other leagues, and especially in the NFL, where the league and teams called out analytics,” said McIntyre. Extreme, which has a partnership deal with the NFL as its preferred provider of Wi-Fi analytics for its Purview software, has provided analytics help at recent Super Bowls in addition to being part of stadium Wi-Fi deployments for the New England Patriots, the Philadelphia Eagles and the Seattle Seahawks, among others. “A lot of times talk about Wi-Fi is simply about coverage and capacity, and more, more, more,” McIntyre said. “The question of ‘what are you doing with the service’ becomes an afterthought.” McIntyre noted that in some cases, the NFL has deployed Extreme analytics on top of Wi-Fi infrastructure with gear from another manufacturer. “What they [Extreme] are able to provide [with analytics] is night and day compared to the competition,” McIntyre said. 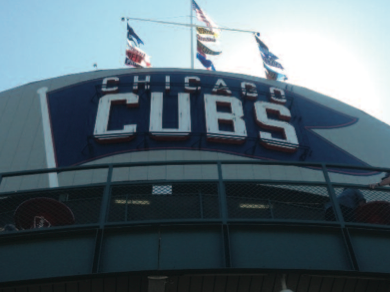 John Brams, director of Sports and Entertainment at Extreme Networks, called the coming Wrigley Field network “a signature deployment.” Wrigley Field itself is expected to have Wi-Fi service in time for the 2016 season, McIntyre said. On the DAS side of the wireless equation, McIntyre and the Cubs team were impressed with the cellular network deployment at the San Francisco 49ers’ new venue, Levi’s Stadium, a deployment done by the lesser-known firm DAS Group Professionals, or DGP. While many may have first heard of DGP for its Levi’s Stadium deployment, DGP does have other large-venue experience, having built previous cellular networks for airports and the San Francisco Bay area’s BART light-rail service. At Levi’s Stadium, DGP worked with the Niners to build a neutral-host DAS deployment that is owned and controlled by the team, an emerging trend for stadium owners and operators who don’t want to simply concede control to wireless carriers. Under a neutral-host deployment the owner or operator of the DAS typically builds a non-carrier-specific antenna infrastructure, and then charges wireless carriers to connect their systems to the back end of that network. At a prior SEAT event McIntyre said the Cubs team talked to the Niners about why they went with DGP, and liked what they heard. Steve Dutto, president of DGP, said the Cubs contract “validates our work at Levi’s Stadium.” The new DAS, McIntyre said, should be fully functional by 2017. Artist rendering of the home plate view after all construction done.